Diesel engines, long confined to trucks and ships, are garnering more interest for their fuel efficiency and reduced carbon dioxide emissions relative to gasoline engines. Argonne mechanical engineer Steve Ciatti takes a crack at some of the more persistent myths surrounding the technology of diesel engines. Myth #1: Diesel is dirty. “We all have this image of trucks belching out dirty black smoke,” Ciatti said. This smoke is particulate matter from diesel exhaust: soot and small amounts of other chemicals produced by the engine. While running, a small amount of extra fuel is added to the combustion chambers in the engine; the resulting heat and oxygen activate a catalyst in the DPF to burn off the accumulated soot. This renders a small fuel consumption penalty. Myth #2: Diesel engines won’t start in the winter. The problem is that diesel jells at low temperatures. Below about 40°F, certain hydrocarbons in diesel turn gelatinous. ​“Since an engine depends on aerosolizing fuel, you don’t want goopy fuel,” Ciatti explained. Often this is remedied with glow plugs, which are heated by the battery and help warm up the fuel so it can vaporize. Glow plugs and other remedies, however, effectively vaporize diesel to prepare it for combustion. Myth #3: Diesel cars don’t perform well. That’s because diesel-powered engines get their best power when the engine’s revolutions per minute (RPM) are low—that is, at speeds below 65 miles per hour, where most driving takes place. Gasoline engines, in contrast, get to peak power by running the engine very high and fast; a gasoline car only reaches its peak horsepower with the accelerator pedal to the floor and the engine running at 5,000 RPM. Myth #4: You can’t find diesel at the pump. Diesel-powered pickups and cars are popular enough that the market has taken interest; most neighborhood gas stations now have automotive diesel pumps. “I drove a diesel car myself for 10 years. I can count on one hand the number of times I had to actually search for a pump,” Ciatti said. Myth #5: Diesel fuel is more expensive than gasoline. Though Chicagoland diesel prices are generally higher than gasoline, in most parts of the country, diesel fuel and gasoline are priced comparably. Today, Illinois taxes diesel at higher rates than gasoline. Bonus: One thing you may not know about diesel! 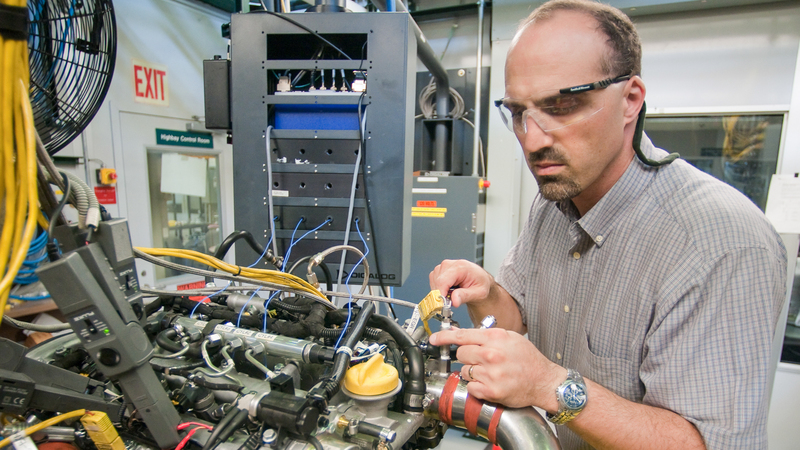 Diesel engines actually perform better at high altitudes than gasoline engines. Why? Gasoline engines operate at a very specific ratio of fuel and air. At high altitudes, the air is thinner—literally: there are fewer molecules of air per cubic foot. In the mountains, then, gasoline engines have to add less fuel to keep the ratio perfect, which affects performance. “But a diesel engine runs fuel-lean; you don’t have to keep the ratio perfect,” Ciatti said. Diesel engines have turbochargers, which are pumps driven by exhaust gas. They add more air to the combustion chamber, and more air means more fuel can be added. At altitude, it can pull in more air and more fuel, and thus gets more power than gasoline engines can. Turbochargers don’t use extra energy; they run off thermodynamically ​“free” energy that would be lost as exhaust if not used.